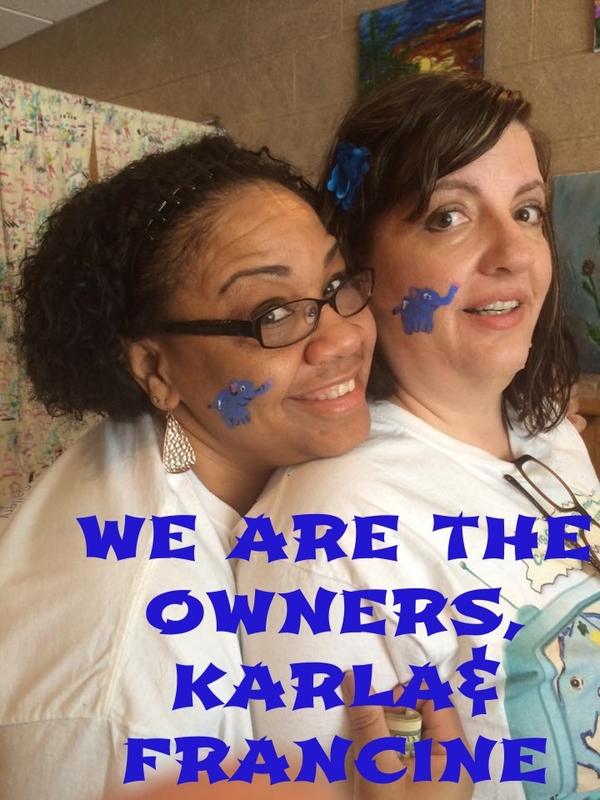 We offer Private and Open ,Paint and Sip Parties and MORE. We are not a franchise we are passionate people who desire to bring joy to enhance people lives here in Michigan through creativity. Read are history and biographies at bottom of this page. Soon there also will be art posted in our Gallery creations for sale from me and other artists .And there will be a small Gallery on site and then once every other month we plan to have Gallery shows. So if your a staving artist like me call or email. We do commission work also we can paint a variety types of pictures like still-life, animals, your pet, landscapes, people and etc. 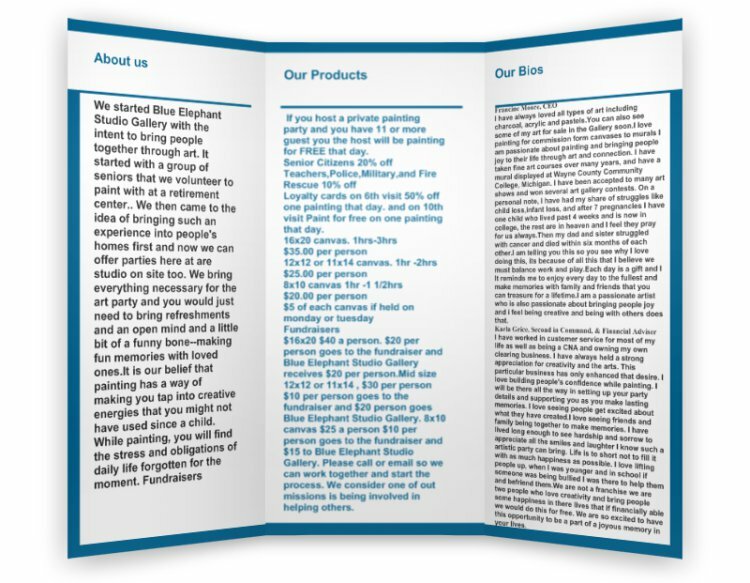 We started Blue Elephant Studio Gallery with the intent to bring people together through art. It started with a group of seniors that we volunteer to paint with at a retirement center and we grew from there. We offer Private and Open parties. We then came to the idea of bringing such an experience into people's homes . We bring everything necessary for the art party and you would just need to bring refreshments and an open mind and a little bit of a funny bone--making fun memories with loved ones.It is our belief that painting has a way of making you tap into creative energies that you might not have used since a child. While painting, you will find the stress and obligations of daily life forgotten for the moment. The Logo was conceived and drawn and painted by Julie Moore. The elephant's name is Marie she is named after my sister Gina Marie Drumm. She told me and my mom to never stop painting. She told us that while she was sick fighting cancer and tragically passed away. She reminded us to enjoy life to the fullest and that each day is a gift. She is in are hearts forever and thinking of her joyous disposition keeps me going on with all my passion for painting and creating and wanting to share that with others. We are also interested in fundraising just give us a call or email. Keep checking us out for all the fun to be had. I will be offer many themed parties including of drawing and painting classes asap. We would welcome ideas or pictures sent for us to produce a picture for the party and you are not obligated to attend if you submit ideas. I will make the picture a simple version we all can enjoy. If you see a picture on the gallery or party check out but it is not on the size of canvas you would prefer I can always adjust the picture to a different size canvas you desire.I can make most pictures for couples where they each paint a separate canvas but together it makes on picture. If the painting has is of a person I usually will be able change hair and skin color and subtle features with no problem to make it more personable just call or send us an email. There also will be art posted in our store for sale from me and other artists.And there will be a small Gallery show on site and then once a month or week we plan to have Gallery shows. So if your a staving artist like me call or email. We use all mediums charcoal, pastel, and acrylic. We can paint a variety types of pictures like still-life, animals, your pet, landscapes, people and etc. I am personally free to also paint on commission for you. I have always loved all types of art including charcoal, acrylic and pastels.You can also see some of my art for sale in the Gallery soon.I love painting for commission form canvases to murals I am passionate about painting and bringing people joy to their life through art and connection. I have taken fine art courses over many years, and have a mural displayed at Wayne County Community College, Michigan. I have been accepted to many art shows and won several art gallery contests. On a personal note, I have had my share of struggles like child loss,infant loss, and after 7 pregnancies I have one child who lived past 4 weeks and is now in college, the rest are in heaven and I feel they pray for us always.Then my dad and sister struggled with cancer and died within six months of each other.I am telling you this so you see why I love doing this, its because of all this that I believe we must balance work and play.Each day is a gift and I It reminds me to enjoy every day to the fullest and make memories with family and friends that you can treasure for a lifetime.I am a passionate artist who is also passionate about bringing people joy and i feel being creative and being with others does that. I have worked in customer service for most of my life as well as being a CNA and owning my own clearing business. I have always held a strong appreciation for creativity and the arts. This particular business has only enhanced that desire. I love building people's confidence while painting. I will be there all the way in setting up your party details and supporting you as you make lasting memories. I love seeing people get excited about what they have created.I love seeing friends and family being together to make memories. I have lived long enough to see hardship and sorrow to appreciate all the smiles and laughter I know such a artistic party can bring. Life is to short not to fill it with as much happiness as possible. I love lifting people up, when I was younger and in school if someone was being bullied I was there to help them and befriend them.We are not a franchise we are two people who love creativity and bring people some happiness in there lives that if financially able we would do this for free. We are so excited to have this opportunity to be a part of a joyous memory in your lives. You can call anytime to schedule parties/ask questions/sign-up for painting parties. Private Parties are on the Calendar / 1st Inventory page once the host picks there Picture to paint, venue, date and time. Then all the guest can register online.